During her recent stay with us at The Beach Club in Pensacola Beach, Florida, travel blogger Ashley Castle set out to discover all the destination has to offer. Located along the Gulf of Mexico, Pensacola Beach sits on Santa Rosa Island, one of the longest barrier islands in the world. Castle took to the emerald waters and white-sand beaches for some R&R and then dove into action with activities like parasailing and sport fishing. She also headed downtown to check out the area’s great shops and restaurants. 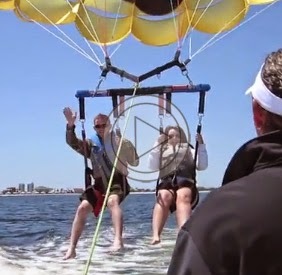 Watch part two of Castle’s video series for an insider’s look at Pensacola Beach: http://www.travelwithcastle.com/experiencing-pensacola-florida/. Check back in two weeks for Part Three: An Authentic Catch n’ Cook Experience!